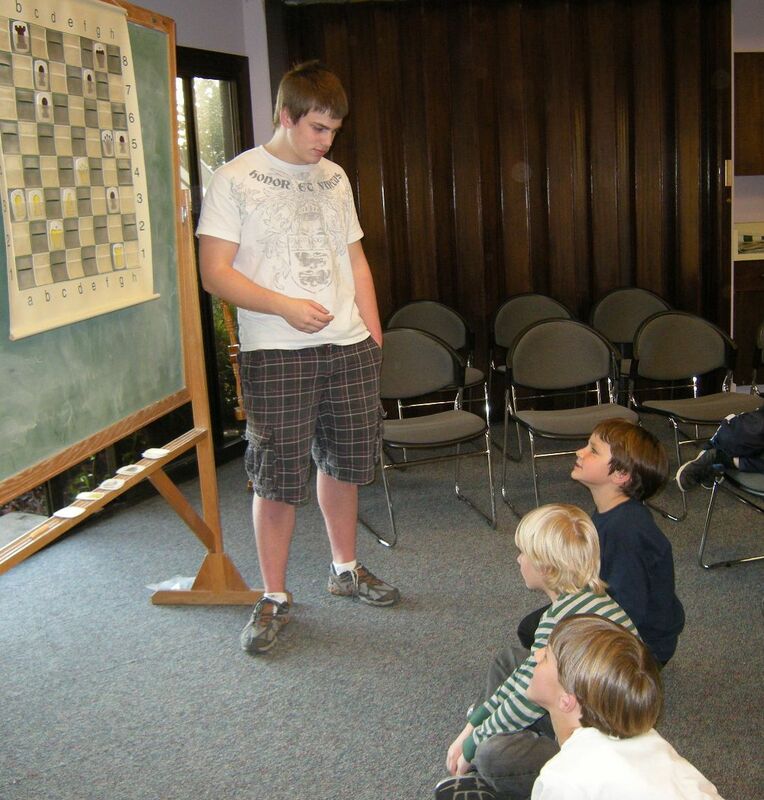 Steven Zierk’s appearance at the Aptos Library chess club yesterday went very smoothly, and I think it was a hit with the kids. We ended up with a crowd of about 60 people, so the room was full to capacity but not beyond. 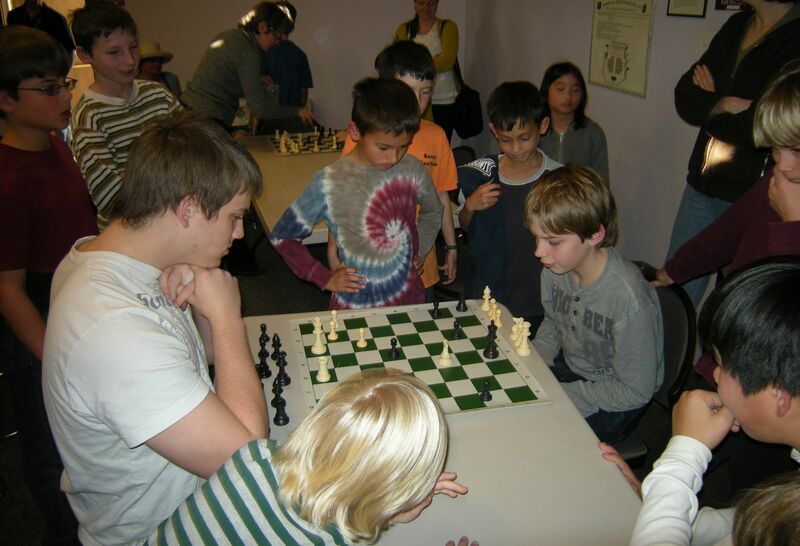 I really liked the energy and excitement I felt in the room during the simul. I had thought that the action might be too slow for some kids, but while they were waiting for Steven to come around they just chattered about their games and plotted their next moves. When one of the kids lost, instantly every other kid in the room knew about it. They always knew how many people were left playing … nine … six … two … one. If they couldn’t win, they at least wanted to be the last one playing. This is one competition where “last” means “best”! In the end, the last person to finish was a boy named Conrad, who has been coming regularly to the club for at least two years. I think he was totally surprised and thrilled to be the last one playing. 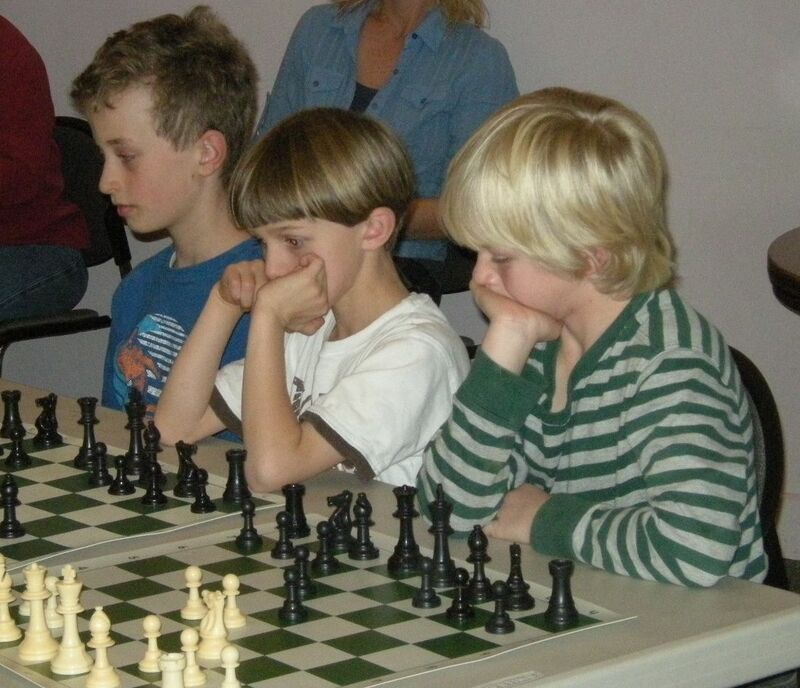 It wasn’t a particularly close game, but Conrad had managed to trade queens and avoid the obvious mates and not-so-obvious mates that most of the other kids fell into. Here’s a picture of the action at the end. I really like the intensity with which everyone is following the game. After the game finished, Steven shook Conrad’s hand, and I awarded him a bronze medal (gold would have been for winning and silver would have been for drawing). In the end Steven went 15-0. I had intended to cap the number of players at 12, but about seven kids came in all at the same time after we had filled up the 12 boards. I set up three more boards because that was all the sets we have, but then I had to made a difficult choice of who could play and who would have to watch. The ones I chose to play were the ones who have been coming to the chess club the most regularly, including Conrad. Fortunately, most of the kids who were denied the chance to play did not seem too upset about it; two of them followed Steven around the room, watching all of his moves, like baby geese following their mother. After the simul, Steven showed us his ninth-round game from the World Under-18 championship against Upadhyaya Anwesh. This is a really great, crowd-pleasing game where both of the kings are wide-open and Steven basically outcalculated his opponent. I had seen it before in the New York Times, and you can play over the moves at the New York Times chess blog. It was especially appropriate for the kids because there are lots of forks and pins, things I have been emphasizing a lot in recent lessons, plus a really pretty and non-trivial checkmate with queen and bishop on an open board. Steven asked me before the game if the kids were at a level where they would be able to solve a simple puzzle with pins (e.g., with black’s bishop on a6 and , White’s pawn on c4 and White’s queen on e2, would they understand that White should not move his pawn?). I told him that I thought they would, and in fact they did answer most of Steven’s questions correctly. In general I thought that Steven’s comments were short and to the point. Occasionally he didn’t give the kids enough time to figure out the position, but you have to remember that time was limited. I was very impressed that he got through the whole game in about 20 minutes. Finally we had a question-and-answer session, which ended a little bit before 5:00 (so his appearance lasted an hour and a half in all). What did I think about Steven? Well, he didn’t come off at all as the sort of intense, hyper-competitive person that you might imagine a chess champion to be. He was very calm and relaxed; I think the word that might best describe him is “unflappable.” Also “unpretentious.” In every way he just seemed to be a normal high-school age kid. It was up to me and the library staff to point out what an unusual and remarkable accomplishment his victory was. After the event was over I took Steven and his mother out to dinner at Severino’s, a local restaurant. Here are some random facts I gleaned from our conversation at dinner as well as before the event and during his Q+A session. He has a chess scholarship offer from University of Texas at Dallas, but he is also seriously considering other colleges, such as the Ivy Leagues. I think that he is really uncertain about whether his future lies in chess or elsewhere. He is also very interested in mathematics (which his father is good at) and in fact he will be starting a college course in multivariable calculus next week. I think I’m going to write a separate blog post on the differences between math and chess — not so much because I expect to influence Steven’s decision but just because it’s an interesting topic. Steven said he hasn’t talked a lot with either with his chess coaches or his teachers about what he should do, so I think it will be a very personal decision of what feels right to him. Of course it’s really not an either-or decision, math or chess; plenty of people continue to play chess actively and successfully during their college years, no matter which school they attend. Nevertheless, I think that the decision between UTD or the Ivy League will say something about where Steven sees his priorities. What helped him do so well at the world championship? Steven made an interesting point. The U.S. contingent had a coach (Matikozyan, perhaps? I’m not sure.) who helped them prepare for the openings. They would look at the opponent’s previous games and then the coach would give Steven a line to study and play. This made an especially big difference for him because he considers the opening the weakest part of his game. (Hmm… This was a bit surprising for me to hear, because I’ve seen him rattle off 20 moves of an opening in about 5 minutes against Yian Liou.) As I’ve noted before, Steven’s middlegames are strong and his endgames are way beyond most players his age. So once he got out of the opening successfully, he was in great shape. He said that there was only one game in the tournament where he was in serious trouble. Also, I think his unflappability must have helped. For many kids, especially from the U.S., this would have been their first time playing abroad in an international tournament. In fact, it was Steven’s first trip outside the U.S. without his parents. Getting over the culture shock, getting over your homesickness, learning to cope in another country (even if you are well looked after by chaperones) are non-trivial things for a kid. Steven’s maturity, I’m sure, made a big difference. Why did Steven give up chess for five years? Steven basically didn’t play tournament chess from age 9 to 14. The reason was simple: he was very shy when he was younger (his mother nodded vigorously at this). He was uncomfortable with being the #1 or #2 player in his age group (mostly #2) and being the center of a lot of attention. This was amazing for me to hear, because he is completely the opposite of shy now! What other hobbies does he have? He also has a second-degree black belt in tae kwon do. However, he is not actively participating in that sport any more; it pretty much coincided with his years away from chess. For the last year or so he has been training at the gym, competing with the football players at weight-lifting. He seemed pretty pleased with this, and I could see that he has bulked up some. Even if he has a reputation at school as “the smart kid,” he doesn’t look like the stereotypical smart kid! Enough already about Steven Zierk! How was Severino’s? This was my second time there. I had heard a lot about it and seen ads for it on TV, and I think it was very good. My salmon dijon was a little bit adventurous (salmon with mustard?) but the mustard sauce was not too intense and I liked it. Mrs. Zierk chose the special of the night, sole, and Steven had a stuffed chicken that looked yummy, and of course he ate every bite. What I didn’t realize was that Severino’s has a discount of 50 percent on almost their entire menu on Tuesdays, so it was the perfect night to treat the Zierks to dinner there! The restaurant was packed — of course all the locals know it’s 50-percent-off night — so it was a good thing we came early. It’s also a good thing I didn’t read the online reviews, which say that the service is very slow on Tuesday nights. That wasn’t the case for us at all. I do have one warning to the wise, however. Severino’s adds an 18 percent gratuity to the bill, based on the pre-discount prices. That’s fair enough. But I was too engrossed in my conversation with the Zierks even to check the bill, so I failed to notice that the gratuity was included. Therefore I added my regular tip on top of the tip that was already there! So the waitress got something like a 40 percent tip last night. D’oh! Hope she enjoyed it. Also, I want to thank the staff at Aptos Public Library, Nancy and Heidi, for being super-supportive in every way, from publicizing the event to welcoming the Zierks to helping me with crowd control. What a team we have! What do you think of his game against GM Durarbeyli in light of your previous blog post about 1…a6 2…c5? In this game, Black plays …a6 and …c5. 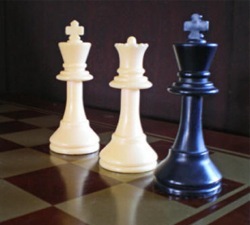 White responds with e4, c3, d4 – so it shares similarities with the discussion you had. Nonetheless, Black loses pretty badly. GM Khachiyan on chess.com criticized the move …a6 as “giving Black a very bad Alapin”. This is a question that Mike Splane should really answer, because it’s his pet variation. I think that the difference between Mike’s games (1. e4 a6 2. d4 c5) and the Zierk-Durarbeyli game is that Mike doesn’t recapture immediately on d5. Note that because the move order was different in Zierk-Durarbeyli game, Black did not have the option of postponing the capture.